Happy Birthday to you Jon! And apparently, Charlize was born in 75 like me! Now obviously that's a reason to get in touch, eh? Happy Birthday, Jon! All the best Wishes to you. Well, it's mine today, so "same month" will have to do for me! Happy birthday from me as well! (Almost too late to the party, because the frontpage continues to say upcoming birthday and then it suddenly vanishes). Alfred Hitchcock's screen version of Frederick Knott's stage hit Dial M for Murder is a tasty blend of elegance and suspense casting Grace Kelly, Ray Milland and Robert Cummings as the points of a romantic triangle. Kelly won the New York Film Critics and National Board of Review Best Actress Awards for this and two other acclaimed 1954 performances (Hitchcock's Rear Window and her Oscar®-honoured work in The Country Girl). She loves Cummings; her husband Milland plots her murder. But when he dials a Mayfair exchange to set the plot in motion, his right number gets the wrong answer and gleaming scissors become a deadly weapon. Dial "M" for the Master of Suspense at his most stylish. It started really boring and I feared that I am watching a big stinker. To much boring talk in the beginning. This seems to be a trademark for Hitchcock. His movies often start out with a lot of exposition talk, where I can't help that my mind wanders off to other things. The movie picked up when the murder happened. It really got great when the inspector came in. It really reminded me of a good Columbo episode. The inspector really behaved a lot like a mix between Columbo and John Cleese. He even had the famous "one more question" Columbo scene. How the inspector unraveled the mystery was really fun to watch. In retrospect even the beginning was like a Columbo episode. Also there I often find the first half an hour boring, where the murder plans and commits the murder. And also there it only picks up when Columbo first appears. None of Hitchcock's films has ever given a clearer view of his genius for suspense than Rear Window. When professional photographer J.B. "Jeff" Jeffries (James Stewart) is confined to a wheelchair with a broken leg, he becomes obsessed with watching the private dramas of his neighbours play out across the courtyard. When he suspects a salesman may have murdered his nagging wife, Jeffries enlists the help of his glamourous socialite girlfriend (Grace Kelly) to investigate the highly suspicious chain of events... Events that ultimately lead to one of the most memorable and gripping endings in all of film history. I went into it with high expectations. Probably this is why I was disappointed. I have seen this story hundred times now, and I expected to have it more impact coming from Hitchcock. But it didn't for me. I even go so far to say, that I enjoyed the Due South version I watched recently more. A Due South episode? You enjoyed a Due South episode more than the original film? Good grief. I think you'd been led to expect the wrong thing by seeing diluted versions. The stories I've seen based on it always make the murder plot and catching the bad guy the focus. While that's fun, it's short-lived so it's never the most important thing in a Hitchcock film; it's about how the murder affects people, how a community handles the dark side of life that they would never dream would actually happen. That's why the real story in his films are usually romances. I haven't seen the Due South one, but I can't imagine it had detailed neighbours with their own mini-sub-plots. I see I forgot again to announce the next deadline. I will switch back to annouce the new deadlines on Sundays, because chances are better that I remember to do it then. Master of Suspense Alfred Hitchcock directs a delightful comedy-mystery set in New England. It stars John Forsythe, Academy Award® winner Edmund Gwenn, Mildred Natwick, and little Jerry Mathers. In addition it marks the noteworthy screen debut of Academy Award® winner Shirley MacLaine. What is The Trouble With Harry? Well, it's the fact that he's dead, and while no one really minds, everybody thinks they are responsible. After several unearthings of the corpse, plenty of humour a la Hitchcock, and love affairs between the major characters, the real cause of death is revealed, and Harry troubles no one again. It's a delightful romp and a decidedly different movie from the Master of Suspense. I enjoyed this little comedy. It was fun how they constantly dug up Harry just to bury him again. You can see that Hitchcock made this movie just for the fun of it. So we can't watch it anymore...? Cary Grant plays John Robie, a reformed jewel thief who was once known as "The Cat," in this suspenseful Alfred Hitchcock classic thriller. Robie is suspected of a new rash of gem thefts in the luxury hotels of the French Riviera, and he must set out to clear himself. Meeting pampered heiress Frances (Grace Kelly), he sees a chance to bait the mysterious thief with her mother's (Jessie Royce Landis) fabulous jewels. His plan backfires, however, but Frances who believes him guilty, proves her love by helping him escape. In a spine-tingling climax, the real criminal is exposed. Three Academy Award® nominations, including an Oscar® for "Best Cinematography." Hmmm, a bit (just a bit though) disappointed here. I remembered this way more exciting than it was, from when I saw it numerous time as a kid. 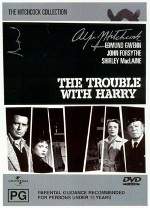 Well, if The Trouble With Harry was Hitchcock's take on a comedy then To Catch a Thief is his attempt at a romance. There is hardly any suspense, really, except for the exciting roof top scene at the end. Heck, technically this is even a "whodunnit", something Hitchcock normally despised (at least didn't care about) and avoided to do. He could have improved it a bit by fleshing out some of the other suspects a little better. Disappointed aside, this is a very good film (just not what you'd expect from the master of suspense...). The dialog is extremely good, delivered with excellent timing, especially by the three lead cast members. The first half is also very comedy-like, where Cary Grant even gets to do his schtick a few times. The characters are all quite well motivated and the romance developed quite nicely and even for today's standards considerably believable. Of course Cary Grant was actually much too old to be the love interest (yes, you read that right), but he sure was still extremely handsome. The fireworks scene was much better in my memory than what I saw on screen. Harry is dead, and his body is causing trouble for the various people who come across him! This is nice change of pace for Hitchcock and although it doesn't have anything to really mark it out in visual terms (apart from the gorgeous Vermont location), it is joyfully mischeivous. Apparently it took a while to find an audience in America and certainly this is much more an English story. Perhaps Hitch was feeling a little homesick for some Ealing! The macabre, yet delightful plot isn't so far removed from The Ladykillers, with the rather matter-of-fact attitude the various characters have to Harry's condition. The way they bury him and dig him up again multiple times is hilarious, but must have been quite shocking to those not used to such ideas being used for comedy (apparently Hitchcock wanted to see how the US would react). But comedy it is and a fine one at that, subtly performed by a small cast, including Shirley MacClaine in her first screen role (and adorable she is too). The other stand-out was Edmund Gwenn, the stories first suspect (not that anyone cares!). It stars John Forsyth, but in this second viewing for me, I couldn't help but find him annoying at first. He won me over though, despite another daft sub-plot of instant marriage proposals! Mind you, I say sub-plot, but as usual, the body is not the real concern. Treating poor old Harry as more of an inconvenience underlines this. For such an unassuming film, it also has another notable first in the score by Bernard Herrmann. Though this is probably the least known of his collaborations with Hitch, it was apparently the directors favourite and it is wonderfully playful. Perhaps because the camera was lazier than normal and there was no suspense to speak of (as it should be in comedy), maybe it was easier for the composer to match the characters more closely, like in a cartoon. There's a lovely moment where the Captain tries to hide his rifle from the deputy sherrif! I've read in other reviews that some critics felt there was something deeper going on. A treatise on death and religion, perhaps? Maybe, if you like, but it still doesn't stop this being one of Hitch's more harmless and infinitely watchable films. I am already announcing the next deadline, because I will try to watch this movie this weekend, as I will not be here the following weekend (I will be in France).